Built tough and designed to last, Metallic Products’ roof curbs provide a level, weather-tight mounting surface for your company’s mechanical equipment. 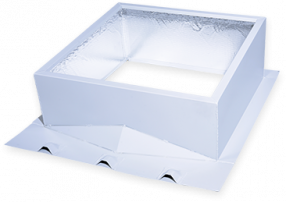 Our roof curbs feature integral flanges which work with any metal roof panel and are made to match specified roof pitches — both single-slope and ridge mounted. All metal building roof curbs include crickets to divert water around the curb. Keep moisture at bay, and your metal buildings standing strong for years to come, with a Metallic Products roof curb. Rugged, 16-gauge Galvalume steel construction. Corners are mitered and welded watertight using a siliconized bronze wire for a long-lasting and non-corrosive finish. Welds are finished with a protective zinc primer. FSK faced rigid board insulation is optional. Curbs are made to match any roof slope and can be either ridge or single slope mounted. Curb corrugations match virtually any available roof configuration and can be factory welded into curb skirts or shipped loose for field installation. Curbs can also be constructed utilizing a two-piece design with a separate under-panel diverter to achieve shingling effect without the need to cut into roof panels. Painted to match most metal buildings after fabrication. NOTE: When ordering, please indicate size, roof panel type, if insulated, if painted, and roof slope.